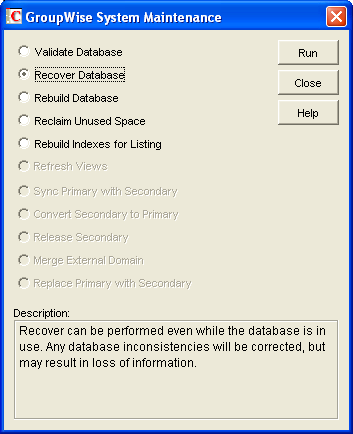 The database recover process corrects physical problems in the database structure, but does not update incorrect information contained in the database. If you receive an administrative message informing you that an internal database error has occurred, or if you detect database damage and don’t want to take users out of GroupWise, you can recover the database. If no errors are reported after the recover process, you do not need to take further action. The recover process is run against a copy of the domain database (wpdomain.db) or post office database (wphost.db). Therefore, while the recover process is running, you can continue to access the database through ConsoleOne and you do not need to stop the MTA or the POA. As the copy of the database is created, the recover process skips invalid records. If the number of records in the original wpdomain.db file or wphost.db file is different from the number in the new, valid copy, GroupWise sends an administrative message informing you that data has been lost. When the recover process is completed, the backup database is deleted. For convenience, the agents are configured by default to automatically recover domain and post office databases whenever a physical problem is encountered. See Recovering the Domain Database Automatically or Immediately and Recovering the Post Office Database Automatically or Immediately. Make sure you have network access to the domain or post office directory for the database you are recovering. If you have administration rights in the primary domain, you can recover the primary domain database, the post office databases in the primary domain, and any secondary domain databases. From a secondary domain, you can recover the secondary domain database and the post office databases in the secondary domain. Make sure you have sufficient disk space for the copy of the database that is created during recovery. In ConsoleOne, browse to and select the Domain object or Post Office object where you want to recover the database. Click Tools > GroupWise Utilities > System Maintenance. Click Recover Database > Run. When prompted, make sure the Path to Database is correct. If an incorrect path is displayed, browse to and select the path to the database being validated. Click OK. If recovery is successful, the backup database is deleted, and the new domain database is renamed to wpdomain.db, or the new post office database is renamed to wphost.db. 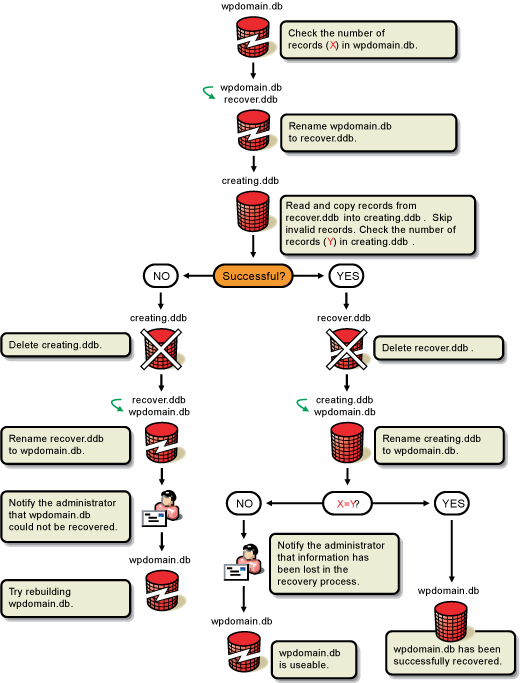 If recovery fails for any reason, the backup database is copied back to wpdomain.db or wphost.db. If any data was lost, you are notified by an administrative message. If data has been lost from the primary domain, you can synchronize it with a secondary domain that is known to contain current information. See Section 29.5, Synchronizing the Primary Domain from a Secondary Domain. If data has been lost from a secondary domain, you can synchronize it with the primary domain. See Section 29.4, Synchronizing a Secondary Domain. You can also rebuild the database at a later time when you have exclusive access to the database where the data has been lost. See Section 26.3, Rebuilding Domain or Post Office Databases.